Perhaps the most important debates can be presented around the proposal for the participation “in the 2018 electoral process;” even more in the debate as to whether the indigenous woman is registered or not as an independent candidate. It’s very clear that the EZLN is in favour of entering the 2018 contest and in favour of the registration of the independent candidate. In that way they will be able to measure the acceptance of the proposal and its incidence in the indigenous population and in the non-indigenous population. If they don’t register the candidate in the 2018 campaign it will be difficult to go beyond the ambit of the adherents to the Sexta, of the close allies and sympathizers. Without registration, the day’s work would be something like the Other Campaign but now with an indigenous candidate. 1. – The mobilization of the EZLN and the CNI in their regional and national ambits. 2. – The mobilization of their national and international allies. 1. – Getting 820,000 signatures within 120 days from voters of at least 17 federative states. 2. – Forming a civil association, presenting it to the Tributary Administration System and opening a bank account for that purpose. 3. – In that way, in this case, the independent presidential standard bearer would have the same rights as her competitors, like access to time on radio and television, public and private financing, and designating representatives to the INE. In other words, the CNI and the EZLN would have to organize and mobilize a network in at least 17 states to get at least one million signatures. Upon achieving that, they would have a first indication of the indigenous and non-indigenous population that supports their initiative in this conservative, racist and patriarchal country. Those million signatures would also be an indicator of the minimum number of votes they could obtain in the contest and to design a campaign to add at least 5 million votes. The initial platform of the Indigenous Government Council and the strength of the indigenous woman’s voice that would set the struggle for life and against violence, dispossession and the destruction that it is submitting to the peoples. It’s very probable that the Mexican State and its electoral political apparatus are following up the CNI-EZLN proposal and defining their strategy towards it. Surely they are also making their evaluations, in other words, the convenience or not of granting registration to the independent candidate of the CNI-EZLN. If the Mexican State and its apparatus evaluate that giving registry to the independent candidate oxygenates the electoral contest obliging the political parties and their candidates to give quality and competition to their electoral offer so as to exceed previous contests and as a result increase voter turnout, the Mexican State would not hesitate in giving registration to the candidate of the CNI-EZLN. 1. It is very clear that it (the campaign) will travel through territories where the Capitalist Beast has planned or carried out investments in so-called mega-projects: highways, dams, mining and wind parks. (It will also travel) through territories under the control of Radical Companies dedicated to the cultivation, shipment and commercialization of drugs, and trafficking of undocumented persons. Both businesses have their own armed forces. 2. The presence of those Companies has fragmented the social fabric of the peoples and has done violence or confronted them not just a few times. 3. The national State at the service of Multinational Capital has used its armed forces not just a few times to undermine the resistance of the peoples that defend the land and territory. 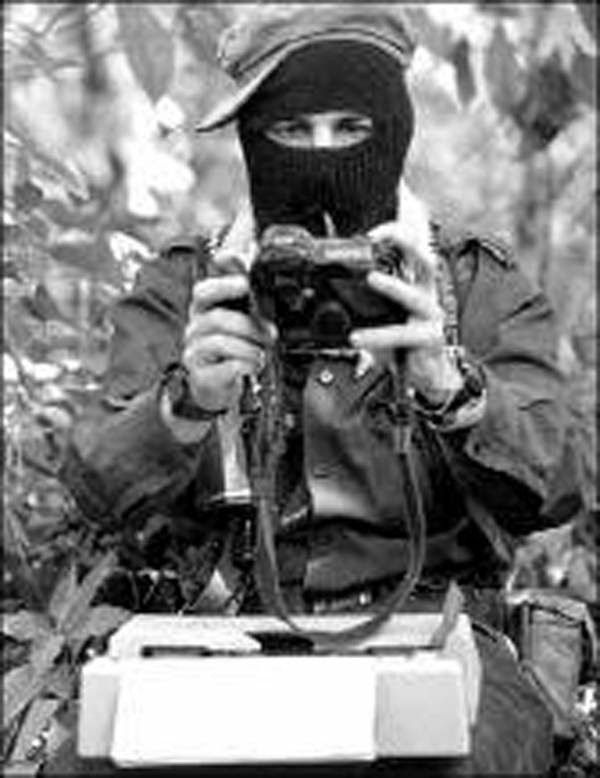 In the logic of the Counterinsurgency Strategy that the Mexican State has designed for annihilating the EZLN and that others call the Integral Campaign of Exhaustion, the CNI and the rebels would be permitted to mobilize and carry out a preliminary campaign to raise one million signatures in 17 states in accordance with Law, a not so easy job, and later… denying them registration and leaving the CNI and the EZLN navigating in a marginal campaign that can be exhausting and frustrating. Anyway, on January 1, 2017, we will find out what the delegates resolved at the Second Stage of the 5th National Indigenous Congress during December 30 and 31, 2016. The first hints of the sunrise appear behind the silhouette of the church on the top of the hill, and the semi-darkness of dawn is punctuated by hundreds of tiny lights. Community leaders, accompanied by about 40 people, then come into the room where we sleep. They light candles on the altar and sing songs of gratitude to the Lord of Tila for this year of autonomy and ask for wisdom, judgment, standards to face the difficulties to come. Copal smoke fills the room and the voices of dozens of people speaking Chol recall ejido Tila’s long struggle for its land and freedom. Three months later, on 16 December 2015, the chant became real. The ejido residents, fed up with decades of abuse and the inaction of the Mexican State, decided to expel the people from the town hall themselves. Since the mid-twentieth century, the town hall had illegally positioned themselves in the ejido’s territory, and their expulsion meant the ejido recovered 130 hectares that the municipal government had been trying to take from them. The town hall, which had done so much damage for so long, was destroyed. The big clock on the top of the facade was broken to bits, and so stopped “Kaxlán” (white people or Mexican mestizo) time, a time that had been imposed by Mexican authorities, a time of institutional dispossession and violence. And so began another time, an indigenous Chol time, the time of freedom. Tila’s miracle had come true. It’s true that in Tila miracles happen, after all thousands of people don’t come here each year in pilgrimage for nothing. But Tila’s miracles don’t fall from the sky, they are made with blood, sweat and tears … and also lots of joy. The miracle of autonomy has been meticulous and tenacious work. After pushing out the town hall, the ejido residents organised themselves according to their practices and customs, and then began carrying out all the necessary activities to administer their 5,405 hectare territory. With contributions from the ejido Tila residents, they bought a truck and organised groups to collect the rubbish. They established a community-watch group, and organised all the neighbourhoods and outlying areas to ensure the community’s security. They developed a system of autonomous justice and began to resolve the numerous cases that under the authority of town hall had remained unpunished. They organised festivals, the ejido assembly became the highest authority, and delinquency, once ignored by official complicity, drastically decreased. One year after this miracle of autonomy, another miracle took place: on 15 December, the radio station “the Miracle of Tila” began to broadcast “from some place in the ejido Tila”. On the radios at home, and from the village’s public announcement system, the ejido’s story of struggle was heard. Stories about the actions of a handful of opponents who had been doing their best to destroy the community’s autonomy, all so they could reclaim their town hall privileges like access to illicit funds, dirty business, and impunity. Girls and boys, young women and men, old women and men came to give their accounts. Messages via facebook and whatsapp arrived from people excited about the community’s new beginning. Songs of solidarity and greetings from groups that had come for the celebration were also heard. Celebrations began around 11 in the morning with an address from the ejido commission and other traditional authorities in the central plaza, in front of the demolished town hall. Two delegates from the National Indigenous Congress (NIC) also took part. They had travelled from Campeche and Oaxaca/Veracruz. There they explained again the proposal of the NIC and the EZLN to establish an Indigenous Government Council at a national level whose voice and face will be an indigenous woman running as an independent candidate in the next presidential elections. This proposal resonated in the hearts of the ejido residents because as the NIC delegate explained “Here the earth has already shaken because the indigenous people are the ones who govern”. The odyssey of the chol people from Tila and their struggle for autonomy over their territory begins in the 1920s, when their grandparents traveled again and again to Tuxtla Gutierrez, then a four or five days journey along footpaths, carrying their pozole and tostadas (fried Mexican tortillas), to request the legalization of their lands as an ejido. These are lands that they had been working as farm labourers for decades for foreign, German landowners who usurped the ancestral lands of the Chol people. This odyssey was told through a theatre piece recounting the tireless effort of the grandparents from 1922 to 1959. Finally a Presidential Resolution was issued recognising the 5,405 hectares of Ejido Tila. It is impossible to express the importance of this document for the Chol ejido residents of Tila. Land is life, and the document expresses the decades of struggle, the pain, the suffering, the abuses, but also the perseverance, the tenacious effort they made to obtain official recognition of what rightly belongs to them. But in the mid-twentieth century the municipal government transformed from an indigenous Chol town council, which ruled using traditional practices and customs, to a regime of political parties. The Town Hall has ever since been trying to strip the ejido residents of 130 hectares where the town of Tila is located. In addition to initiating the collection of land taxes and appropriating goods and services that the ejido assembly had previously administered, the town hall also served as a coordinating body for paramilitary groups, especially the extremely violent “Peace and Justice”, as part of the counterinsurgency war after the 1994 Zapatista uprising. “Things are not as they should be,” explain two women in front of a miniature model of the destroyed town hall building. “Because when the local government functions, there is justice. And there was no justice here, I personally experienced this situation of injustice. If we don’t have money, they will not fix your problem. So for me, I like that this building was torn down, it didn’t serve us at all. We did what we did to this building because it represented total rubbish, and no one working there had a clear conscience”. Right after that, some young people came to set fire to the model town hall building. “This is our message that those who want to bring the town hall authorities back to ejido Tila. If they come back, the same thing will happen again” said the ejido residents. Then as the model burned, a fire cracker hidden in the model exploded. During the time when the ejido was governed by town hall, local customs were not respected. Town hall, with a marketing mentality, dressed up the local Chol traditions as some kind of folklore and introduced festivals that had nothing to do with the local culture. In today’s celebration, the ejido residents reclaim their traditions with a carnival spectacle where the “negrito” and “marucha” do battle with the little bulls and tigers. The performance caused great laughter amongst the audience, who recognised the in the story their own battle in defense of their land and territory. There were also many happy moments of dancing with people of all ages – girls and boys, and elders, both women and men. A mariachi band played some songs including a particularly joyous interpretation of the Zapatista anthem. A child with an extraordinary voice sang “The Blue Backpack”, and space was made for the ejido residents to share their thoughts on the celebration. A judge from the ejido’s justice system, an important step in asserting autonomy and justice, presented a very detailed report on crime and punishment during this first year of self-government. Finally the day finished with a ceremony handing over the baton of government to the autonomous authorities. This ceremony, full of symbolism and great importance, was for the people who throughout this year have become a living example for Mexico and many parts of the world. They have demonstrated that the people can govern themselves, that it is possible to plot other roads with justice and dignity in the midst of a storm. And of course the dance party, which lasted until late at night, a collective celebration so deserved by a community who never give up fighting. This December 11 marked a decade of the beginning of the war against crime launched by former President Felipe Calderon Hinojosa (2006-2012). Ten years later, the toll of violence is alarming: 186,000 dead, more than 28,000 missing, tens of thousands of people displaced according to official figures, a balance comparable to that of Central American armed conflicts in the 1980s. Over the term, according to the media, over one trillion pesos has been spent without reducing insecurity and harassment of civilians with a significant increase in human rights violations. In addition, domestic drug use has increased and, although some capos have been arrested, nine organized crime cartels and 37 criminal cells continue to operate. Civil organizations have ruled that, “the tightening of security measures has not nor will reduce violence in the country. Today we live in a much more insecure country, with weaker institutions and a criminal justice system that does not work properly.” One of the most contested players in the anti-crime strategy has been the Army, which, outside its constitutional mandate, has been deployed to carry out security tasks. From December 1, 2006 to the end of last October, the National Human Rights Commission (CNDH) issued a total of 158 recommendations to the armed forces, of which 121 were addressed to the Secretariat of National Defence (Sedena) and the remaining 37 to the Secretariat of the Navy. Most of these recommendations were issued for violations, such as searches and arbitrary detentions; excessive, disproportionate and arbitrary use of force; injuries, and also for deprivation of life or arbitrary executions; forced disappearances, torture and cruel and inhuman treatment, as well as unduly imputing events to detainees. In this context, the business leadership demanded that the Mexican Army not return to the barracks until state governments have the capacity to deal with organized crime, for which it urged the legislature to pass laws that give greater legal certainty to the armed forces. Mario Patron, director of the Agustin Pro HR Centre, has questioned that “instead of taking seriously the design of a program for the gradual withdrawal of the Armed Forces from the security tasks – as proposed by international mechanisms in this area – it revives the idea of creating an ad hoc legal framework for the Army and Navy, normalizing the state of emergency under the concept of internal security.” For the same reason, dozens of civil organizations, academics and researchers asked the Chamber of Deputies – who were debating this issue these days – “not to hastily approve” military permanence in public security tasks and the suspension of guarantees for the population. First and foremost, in the name of the compañeras and compañeros who are Bases of Support of the Zapatista Army for National Liberation, we thank all of the compañer@s of CIDECI who once again have provided us with these spaces so that we, Zapatista originary peoples and scientists, can gather here as a way to begin to look and walk toward what must be done in this world we live in, which capitalism is destroying. We also thank the compañeros who have worked on registration and coordination for this event. We also thank the compañer@s from the transport support team. We thank you in advance, compañeras and compañeros of the various teams and collectives for the shitload of work that you have done to make this gathering happen. Many thanks. For we as Zapatista men and women, today begins our long walk in search of others with whom we think share the great responsibility to defend and save the world we live in – with the art of artists, the science of scientists, and the originary peoples alongside those below from across the entire world. A handful of some so-called “neoliberal capitalists” have decided to savagely destroy everything, caring nothing at all for this house that we live in. Where are we poor people of the world going to live, because they, the rich, might just go and live on another planet? What should we do now, as we see that they are destroying our house? Or what happens if they take us to another planet to be their slaves? Below there are women and men who study science, who study scientifically, who do good science. But the wicked capitalists come along and use this science to do harm to the very people who discovered that science. What kind of harm? They use science to make the rich richer. The rich use it as they choose, for a destiny other than that for which it was created. They use it to kill and destroy. Now it is getting worse for them up there, and that will be used even more harshly against us living beings and our mother earth. That is how all of these bad things began and how they continue, bringing us to a very dire point today. This is how things happened, and in the same way they use the artists who make art – capitalism uses everything to the detriment of society and for the good of capitalism. What was natural, nature and those who live within it, which is to say the originary peoples, will be destroyed along with mother nature. Therefore, we believe, think, and imagine. We can organize ourselves, work, struggle, and defend who we are – the foundation of this world – so that this world, the house in which we live, can’t be disappeared by the capitalists. Now is the time, brothers and sisters, compañer@s, compañeroas; no one is going to bring us salvation. It is up to us. Begin to dream and you will see that we can only fight capitalism with good scientific science, the art of the artist, and the guardians of mother nature together with those below from across the world. This is our responsibility. I don’t mean to say that we are the only ones who should struggle, not at all. But when we look around at how things are, we realize that all of the useful things that we have in our houses are a matter of science, in terms of where they came from, and all of the figures and figurines in our houses and rooms are the art of artists, and all of the materials for these things come from mother nature, where the originary peoples live. It is as if we are the “seeds” of all of this. Let’s put it even more clearly. Who figured out how to make today’s most modern cellphone? It’s the same for thousands of other products – they are used to benefit the rich, and not for the use science intended, nor for the people. Who figured out how to make the images that are held within cellphones which are now manipulated on any whim? Where did the materials that cellphones are made of come from? The same question goes for thousands of other goods. Capitalism has converted science into something used for harm: something to feed its massive accumulation of wealth; something to manipulate at its every whim. It takes no responsibility for the destruction it has wrought with these actions. One more point of clarity. We are the lifeblood of the rich; we are the flesh and bone that make their lives possible, and the rest of the organs (in this body) are made up of the consumers; meanwhile, they live to do us harm in this capitalist system. The origin of the evil the capitalist system wreaks on us is revealed. Our survival, and the other construction of a new world, is in our hands. Today we are here not to tell each other what to do, but to understand what our function is to capitalism in this world, and to see if what capitalism has us doing is any good for this world that we live in, human and living beings. And if we discover that it is entirely bad, that the use capitalism makes of our sciences is harmful, then we have to take responsibility and decide what to do. Before I finish compañeras and compañeros, sisters and brothers, today December 26, we do not forget that there are lives missing from our midst, the life of the 46 missing young people from Ayotzinapa, Guerrero. Together with their families and friends who continue to search for them and who do not give up or sell out, we Zapatista men and women also demand truth and justice. To these mothers, fathers, sisters and brothers of the missing, we give our largest collective embrace. So, welcome to this gathering, to this long walk of the other sciences during which there is no rest, because rest would mean that the other, new world is already built, and until it is built there will be no rest. May your wisdom, scientists, encounter and embrace our desire to learn and to know about the worlds. From CIDECI-Unitierra, San Cristóbal de las Casas, Chiapas. CIDECI-Unitierra. San Cristóbal de Las Casas, Chiapas, Mexico. From December 26, 2014, through January 4, 2017. 10:00 – 11:00. Inauguration. Words of Subcomandante Insurgente Moisés on behalf of the Zapatista women, men, children, and elders. Closing: Zapatista students and Subcomandante Insurgente Moisés. Final report on the Week of Worldwide Action in Solidarity with the the ejidatarios of San Sebastián Bachajón, held from 4th to 10th December, 2016. Compañeras and compañeros, We send you combative greetings and thanks for your participation in the Week of Worldwide action in solidarity with the the ejidatarios of San Sebastián Bachajón, which took place from Sunday 4th to Saturday 10th December, 2016, International Human Rights Day. Freedom and justice for Esteban Gómez Jiménez, prisoner in Cintalapa de Figueroa, and for Santiago Moreno Pérez and Emilio Jiménez Gómez, prisoners in Playas de Catazaja. We thank you for your solidarity and support, and ask you all to remain alert and aware and responsive as to what may take place in the ejido San Sebastián Bachajón, and to hold the three levels of government and their lackeys responsible for any acts of aggression. Freedom and Justice for prisoners! Juan Carlos Gómez Silvano Lives! The Bachajón struggle continues! Long Live the EZLN! Long live the CNI! In the Global Day of Solidarity and Support to the ejidatarios of San Sebastian Bachajón in their fight against dispossession, the Adherents to the Sexta Barcelona will hold an exhibition and video screenings in the local offices of the General Confederation of Labour (as known in Spanish, ‘Confederación General del Trabajo-CGT’). These events will report on the expropriation of lands and natural resources that the bad Mexican Government plan to implement through the imposition of mega-projects which will bring dispossession and death for the indigenous peoples. The community, located in the northern part of the jungle in Chiapas, where the blue waters come together in the waterfalls, is known for its beauty and unique colour and is attractive and generates tourist interest. This area is part of a comprehensive mega-tourism plan, including projects such as luxury hotels, an airport and golf courses. The intention is to continue destroying Mother Earth and all those who live in harmony with her, the last caregivers of the land that remain, the indigenous peoples, all to further grow the coffers of great capital. In addition there is the San Cristóbal – Palenque highway construction project, which if carried out, would affect several communities in the course of the project, and without regard for the fact that these lands are the life, the home and the sustenance for the communities that live there. And let us not forget the compas held prisoner for defending the land which now has cost them their liberty. I write to you from the financial capital of the Empire, now ruled by a multimillionaire, racist, sexist hotel-tycoon, who has shown absolute disregard for the life and human rights of anyone who does not have a great fortune. Nor does he believe in climate change, or that it is caused by the destructive, capitalist system. His aim is to continue to destroy the planet. With the new Orange Devil as Emperor, Donald Trump, we can expect more building plans, for more arrogant towers, and more casinos that will attract drug trafficking, crime, prostitution and militarization, all while stripping small-scale farmers of their land and forcing them to become hotel employees. A day doesn’t go by without me thinking about you even though I have not met you. I simply know that you are the protectors of the natural resources of the planet and the lands of my country. From here I enjoy the image I have of the Agua Azul Waterfalls that you defend with your life. I cannot thank you enough for your collective resistance, courage and sacrifice. In your work to preserve nature, some of your comrades have lost their lives, and the bad government under the orders of corporate greed has tried to divide you, to buy you off, to create confusion with tangled stories criminalising you and muddying the waters to gain the greedy, upper hand. I am indignant to see how the mass media, in the service of the Big Money, most of the time keep silent or lie about the attacks on Bachajón and the agreements the government has made with the hotel industry; and how they continue trying to evict you, while you promote a tourism responsible and respectful of nature that gives us and the planet life, a place which is our home. But in this threatening panorama they have not been able to annihilate you. From Standing Rock to Bachajón, the original peoples of America defend the water: the Sioux people have just won a battle against the construction of an oil pipeline that would poison water, and the town of Bachajón continues to prevent large tourism consortiums from seizing the blue pools of the Agua Azul waterfalls. Thank you for being the guardians of the planet that we inhabit, compañeras and compañeros. I listen from a distance to the music of the waterfalls that you defend and I will keep resisting so others hear it too. Video about the Week of Worldwide Action in Solidarity with the adherents to the Sixth of San Sebastián Bachajón, from the 4th to the 10th of December, 2016. As part of the closing of the Week of Worldwide Action in Solidarity with the ejidatarios of San Sebastián Bachajón, the ejidatarios and the family of the late Juan Vázquez Guzmán have sent a video message of gratitude and solidarity through the voice of Julian, brother of Juan Vázquez Guzmán. Julian lists the names of all the countries, organizations and social activists that have participated and sends hugs of fellowship and thanks to everyone. The participating countries include: Canada, England, Germany, Italy, Mexico, Peru, Spain, the United States and Uruguay. On December 5, the “Forum on Defence of the Earth, Life and Territory” was held in the ejido of Amador Hernandez, in the Municipality of Ocosingo, Lacandon Jungle. About 1,000 people from communities in the region analysed the problems they are experiencing, including several agrarian conflicts. According to the authorities, the Environmental Gendarmerie will “have the mission of preventing administrative crimes and faults in environmental matters, due to its security and police operational model.” It is envisaged that it will be installed in 61 points of the country, among others, the Lacandon Jungle, Montes Azules and the monarch butterfly reserves, Pico de Orizaba, Nevado de Toluca and Tulum. It should be noted that on the same day, President Enrique Peña Nieto was in the Lacandon Jungle in the framework of an activity, which was part of the COP (Conferences of the Parties) 13 under the heading “Integrating Biodiversity for Wellbeing”. In that context, he instructed the Secretariat of Agrarian, Territorial and Urban Development to prevent the regularization of irregular settlements; and the Secretariats of Energy and Economy, to ensure that there are no hydrocarbon or mining explorations or holdings in the region. It’s time for us all to follow the lead of those in Standing Rock and Honduras, and stand, resist and act fearlessly. Around the globe, land has become gold-standard currency. As a result, Indigenous and other land-based peoples face threats to the natural commons on which they live, produce food and sustain community, culture and cosmovision. In some places, organized Indigenous movements have stood up and fought off extraction and corporate development, winning protection of waters, forests, territories and more. In most places, the resistance has been met with assassination and violent repression by state security forces and corporate-financed hit squads. Two of the fiercest Native battles in the Americas today are closely connected. They are led by the Standing Rock Sioux in North Dakota and by the Lenca people in Honduras, organized through the Civic Council of Popular and Indigenous Organizations of Honduras (COPINH). Both are hard at work defending their territories and waters from further theft and desecration: At Standing Rock they are struggling against an oil pipeline being laid under their ancestral Missouri River, which they use for ceremony, drinking water and sustaining other life; on Lenca lands they are resisting the damming of their ancestral Gualcarque and other rivers. In both cases, the movements face enormous stakes. And they both know that, as Howard Zinn said, “The power of the people on top depends on the obedience of the people below.” So they are challenging the power on top with shared strategies of mass mobilization and direct action. They both have the capacity to inspire the world, as seen by an outpouring of active solidarity with their uprisings from around the globe. Each is enduring tremendous assault. Standing Rock Water Protectors have suffered dog attacks, water cannons in sub-freezing temperatures, rubber bullets and tear gas. Twenty-one-year-old activist Sophia Wilansky risks amputation of her arm after being hit by what witnesses claim was a concussion grenade. Vanessa Dundon may lose permanent sight in one eye after being hit with a tear gas canister. Red Fawn Fallis is in prison, facing a trumped-up federal charge. More than 500 others have been arrested. COPINH founder and leader Berta Cáceres was slain this past March by the Honduran government and an internationally financed dam company, with at least implicit backing from the U.S. government, which funds the Honduran military. More than 90 additional COPINH members have been killed, and another 90 or so permanently injured, over the group’s 23-year history, according to Lenca Indigenous coordinator Tomás Gomez. Gomez himself has survived three assassination attempts and been beaten by soldiers twice since March. The Standing Rock Sioux and the Lenca, moreover, each claim one of the greatest leaders for Native autonomy and territory in their country. Sitting Bull (c. 1831-90) and Lempira (d. 1537) were powerful spiritual and military leaders who fought back conquest by Americans and Spanish, respectively. On the gentle North Dakotan hills — recently covered with yellow-brown grasses, now buried in white snow — where thousands of Water Protectors are convened, we talked with Native people about their counterparts in Honduras. Some knew about COPINH and especially about Berta Cáceres. All felt their lives, stories and fates reflected in their Honduran counterparts. To help those on the front lines turn the tide, we must all stand with Standing Rock. December is Global Month of #NoDAPL Action. Call banks that have invested in the Dakota Access pipeline and urge them to pull their funds. Almost $18 million have already been divested from the project. Look for more ways to lend support here. The best way to turn the tide in Honduras is to cut US military aid to the government, which runs the most dangerous country in the world in which to be an environmental defender. Work for the passage of the Berta Cáceres Human Rights Act, which will be reintroduced in the new US Congress in January. Keep up-to-date here. Berta Cáceres loved to say, “They fear us because we’re fearless.” With so much at stake for humanity and Mother Earth, it’s time for us all to follow the lead of those in Standing Rock and Honduras, and stand, resist and act fearlessly. This article was originally published by Truthout. Week of Global Action in Solidarity with the ejidatarios of San Sebastián Bachajón from the 4th to the 10th of December, 2016. From northwest England we send love, solidarity, rage, respect, tenderness and strength to the companions of the Sexta Bachajón. Since the 4th of December we have posted daily news on the struggle of the Sexta Bachajón and the week of solidarity through the Facebook network of the Manchester Zapatista Collective. Following a call from the MZC, these posts were re-sent by many people connected to this page. On 10th December the Anarchist Book Fair was held in Salford and Manchester, sister cities in North-West England. Individuals and collectives from throughout the North-Western region, including the cities of Manchester, Salford, Bolton, Bradford, and Liverpool, and the Welsh region, all came to the fair. Leaflets were distributed on the situation faced by the compass of the Sexta Bachajón, the case was reported in a talk given by MZC on the current situation of the Sixth and the Zapatista communities, and the creation of a poster was encouraged, using the materials available (that is, paper and coloured pens …) where people and groups who participated in the fair left their messages of solidarity for the Sexta Bachajón. Land, justice and freedom for the ejidatarios of San Sebastián Bachajón! Juan Vázquez Guzmán lives! Juan Carlos Gómez Silvano lives! The Bachajón struggle continues! No more aggression against adherents to the Sexta! Long live the EZLN! Long live the CNI! Long live the autonomous Zapatista communities!